Add Lisbon to Your "Must See" List! Lisbon, Portugal has risen to the fore on the news front of Inclusive Destination Development. Dave Player of Wheeling Around the Algarve would like Rolling Rains Readers to know about the new services available through Accessible Lisbon his neighbor to the north. 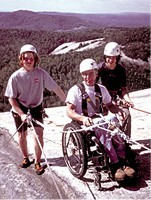 The American Adventure Service Corps (TAASC) reported the longest rapel by someone in a wheelchair as 900 feet in 2003. Do any Rolling Rains readers know if that record has been broken yet? Continue reading Wheelchair Rappel Record. Chile's Lago Pe?uelas National Park now has a thoughtfully designed trail and interpretive system that users are acclaiming. The wheelchair accessible trail has nine bridges, two pergolas, numerous rest spots, and signage in Braille. Similar to the approach taken by Coco Raynes in various Columbian museums the site provides replicas and bass relief representations of the local fauna for those with visual impairments. Continue reading Las Orquideas: Chile's First Wheelchair Accessible Multi-Sensory Nature Trail. Another reason to head downunder -- as if anybody needed one -- is Disabled Surfers Association of Australia!. "Usability" is the term common among designers of digital information and information interfaces who are interested in Universal Design. Universal Design arises from disability culture in which human variability is definitive and, increasingly, a source of pride and inspiration. Disability culture and its products such as Universal Design interact with values and artifacts produced by other cultures where non-disability is the dominant cultural norm and the rewarded bodily status. It is instructive to observe to emergence of conversations such as the one at UI Garden where a threefold self-aware conversation takes place between UD, Eastern and Western cultures. Continue reading East Meets West Around Universal Design. Some understand the idea of Universal Design - its seven principles and its historical grounding in the civil rights movement. Some understand the growing market demand and have positioned themselves well to provide timely solutions. Still others have the skill and artist's sensibility to distinguish their work with a sense of style. Less have the ability to combine all these. Fewer still have the commitment and passion to shepherd the very idea of Universal Design into new realms. I am always impressed by those who get the "big picture" about Universal Design. Ideas, like products, have a "life cycle." It takes the right person to launch an idea on a new cycle. I have been privileged to meet several - not surprising since I regularly travel around the world to seek them out! From my short observation it appears that Marc Mendelsohn is one of those people - and he is in my own back yard. Continue reading Marc Mendelsohn @ Universal Design Specialists. Darren always has something interesting going over at Get Around Guide -- the blog. Save the dates April 24 - 26, 2006 for the National Association of Home Builders event, "Building for Boomers & Beyond: 50+ Housing Symposium 2006." Some news items are most interesting for the ways that they "talk to each other." Consider this article on the economic value of eco-tourism. Note that, if mismanagement of the natural heritage of the US continues unabated, exisiting Universal Design solutions such as the Universal Trails Assessment Process created by Beneifical Designs will not be implemented. Continue reading The Universal Trails Assessment Process. The Emerging New York Architects Committee (ENYA), AIA NY Chapter, has announced the second biennial international ideas competition to explore issues of universal design and historic rejuvenation in developing a visual / performing arts center on Roosevelt Island. The registration deadline has been extended to December 18, 2005. Visit www.enyacompetitions.org for further information. There is a change in the air. I have been scanning the Engadget blog aimlessly recently. It must be "window shopping season" - too late for back-to-school and not quite time to buy holiday gifts. Unfortunately for my bank account, I found sometyhing that I just must have: Live Luggage! Continue reading Live Luggage Meets a Universal Design Need. MAKING Adelaide Airport's new passenger terminal accessible to everyone, especially the disabled, was a major challenge facing the designers. The new facilities, opened to the public over the weekend, demonstrate the world-leading Universal Design principles that should be used in all developments, according to a leading disability standards expert. Continue reading Adelaide Airport Gets Universal Design Makeover. Gracias a Diego Alejandro Sadras of Argentina we have news about an accessible transport service in Argentina: Transpdisc. They offer pick up from the International Airport of Ezeiza or the Port of Buenos Aires. They also offer excursions. They have been around since 1996 and their site is trilingual: English, Spanish, and Portuguese. Susan M. LoTempio traveled a relatively short distance as a tourist - Buffalo to New York City - although, for the price of her concert ticket, she could have flown to LA roundtrip. Continue reading A Tourist's Dilemma - the ADA Line of Sight Clause. Apparently there are a few other people paying attention to the lack of transparency, accountability, and community participation in post-Katrina rebuilding schemes. These two Letters to the Editor appeared yesterday. Continue reading Katrina Recovery Watch: People With Disabilities on Point Positions. A Note to Hotel Designers: Universal Design Says "Quality"
It is always a little disheartening to find out that I am no more than a lemming in my style preferences. The door operators in my home? Lever. The finish on my bathroom fixtures? Brushed nickel. Brushed nickel is a popular finish for new home buyers, even when it costs more...Buyers in higher-priced houses want levers instead of knobs on their doors. The article doesn't say so but chances are good that these same high-end home buyers respond to lever door handles in hotels, spas, and resorts with the thought, "That's quality - and it feels like home!" Universal Design is defining the hotel of the future. Once it gets out the door it will define the whole neighborhood -- Inclusive Destination Development. The Center for Inclusive Design and Environmental Access (IDEA Center) in the School of Architecture and Planning has received a $5 million grant from the U.S. Department of Education's National Institute on Disability and Rehabilitation Research (NIDRR) to fund a second five-year cycle of its Rehabilitation Engineering Research Center on Universal Design and the Built Environment (RERC-UD). Although the IDEA Center is the grant recipient, in operating the RERC it now will collaborate with the Ontario Rehabilitation Technology Consortium (ORTC) and representatives from the design and disability communities nationwide. Co-directors of the center are architect Edward Steinfeld, UB professor of architecture and director of the IDEA Center, who is nationally recognized as one of the early developers of the concept of universal design, and Geoff Fernie, vice president for research at the Toronto Rehabilitation Institute, a member organization of ORTC. Here in Northern California the network of organizations providing leisure and travel services to people with disabilities is maturing steadily. Getting to a business meeting, the mall, a Seahawks game or even to a restaurant for a date with his wife, Emily, often means a long bus ride for Michael Rogers of Kenmore, and for many other wheelchair users in the Seattle area. Not so in Portland, where at least two taxicab companies offer wheelchair-accessible cabs. Continue reading Mexico City's First Symposium on Universal Design. Even the Title Gets it Right: "Beyond Compliance"
Metropolis magazine features a great interview with Valerie Fletcher, Director of Adaptive Environments. Continue reading Universal Design in Spain. Households of all ages have roots in their communities and strong emotional ties to their homes. Few people want to move solely because their house no longer fits their needs. The problems faced by older individuals are compounded by the fact that they often live in the oldest housing stock. If you want to stay in the home, how do your prioritize your projects? How do you judge need versus want? Many of the answers will be provided at National Aging in Place Week, today through Saturday, featuring a series of programs and seminars offered in dozens of communities across the country and coordinated by the Aging in Place Council and the National Reverse Mortgage Lenders Association. Continue reading Aging in Place Fair in Seattle. 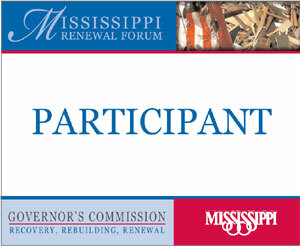 Who will represent Universal Design in the HUD grant competition for rebuilding after Katrina? affected by Hurricane Katrina or Rita (or both). Continue reading Universities, Visitability, and Inclusive Destination Development. The Boomer Tax Base: A Lesson in Destination Development? "Enticed by the appeal of keeping tax-paying senior citizens in place who don't have young children enrolled in the school system, suburban towns have been welcoming age-restricted housing with open arms," writes Bill Doak in "From the Age of Aquarius to Age-Restricted Housing." "Designed to appeal to the baby boomer generation and up - the housing is for those age 55 and older - the development is the hottest trend in new home construction, " he continues. Universal Design is incorporated into the homes. Continue reading The Boomer Tax Base: A Lesson in Destination Development?. Some ideologues argue against accessibility because it "beaks the esthetic." The truth is, an esthetic that permits inaccessiblity is already irrecoverably broken. Launching into study of Christopher Alexander's Pattern Language has been an engaging intellectual exercise. By no means can I claim to have mastered his thought but some initial thoughts occur to me. Resonant with Chomskian sensibilities the search for gramaticality in Alexander's work seems to substitute for the proscriptive esthetics of more precious constructs like New Urbanism. That is a hopeful sign. 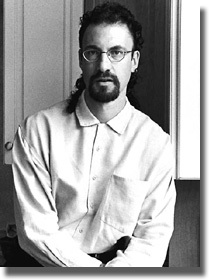 Alexander's essay "Methods" which discusses the role of " generative sequence" and its essential feature as being "backtrack-free" strikes me as the Pattern Language argument against retrofitting ("backtracking") - and, by extension, as argument for Universal Design. Continue reading Pattern Language & Universal Design. New York Institute of Technology in Manhattan invites presentation proposals for the Interdisciplinary Conference: New York: City in Motion. Rolling Rains readers may be interested to present their ideas on Universal Design and Inclusive Destination Development. For those wishing to be linked with other readers to discuss a collaborative presentation contact the editor, Scott Rains: srains (AT) oco (DOT) net. This day-long conference will take place on Friday, March 10, 2006, in NYIT?s state-of-the-art conference facility near Columbus Circle. The organizers welcome and encourage technology-enhanced presentations. Continue reading New York: City in Motion. What Ought a "Livable Community" Look Like? Continue reading What Ought a "Livable Community" Look Like?. Susanne Pacher at Travel & Transitions has reprinted an article that I did for "Slovakia" magazine. Accessibility is a project they are still working on but it a country with heart. Read To Slovakia - Via Rio - from the Seated Position. Is Lehigh Valley Senior Friendly? It's true. Lehigh Valley and Allentown do not show up this year on Conde Nast's top ten destinations list. They do have something in common with smart destinations however. They began the research necessary for Inclusive Destination Development in 2001 by examining their Livability. Read "Is Lehigh Valley Senior Friendly?" Instead of knobs, many people choose levers to give them the upper hand in opening and closing doors. Once marketed only to older people, the levers are now targeted at homeowners of all ages, especially if the builder is using universal design principles in a house.